When I was 12 years old, my family moved to the states from Colombia (not Columbia.) Although I was super excited to move to the place where potentially this could happen, it was clear to my brothers and me that the main reason for my parents’ decision, was to provide us with the best higher education in the world. 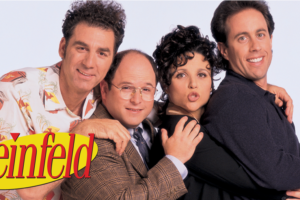 But is a college degree in the U.S. really worth the $100,000 – $250,000 investment? Generally, people would answer “yes” to this question. It must be…, right? Here at Zoe, we believe in questioning generalizations and try our best to develop our opinions using a data-centric approach. As is so often the case, once you dig a little bit deeper into any question, the answer is “it depends”. To explain what we mean by this, let’s start by tackling the question of whether or not college education matters at all. Does College Education Matter At All? In today’s economy, where technological advancements move at a staggering pace, some argue that experience trumps formal education. College education is supposed to prepare you for the future world in which you will be living. This means that the curriculum should ideally be ahead of the technology curve. 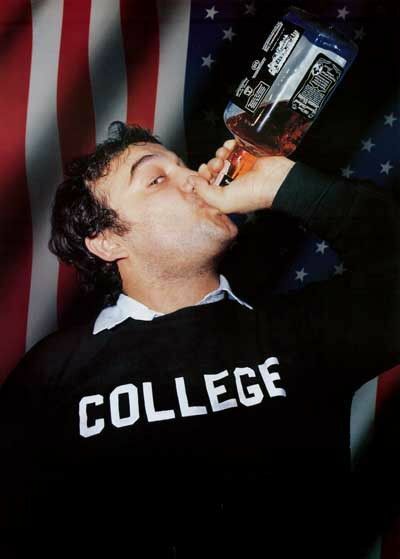 In reality, however, this is more often than not unfeasible, and is compounded by the fact that 1) the American education system is still modeled on a 19th century approach, designed for the industrial era and 2) the cost of college has increased over 3 times faster than inflation over the last 35 years. Some may argue that your time could be better spent watching Khan Academy video lectures and your money could be better spent starting your own business. Others, like Peter Thiel, even go as far as calling American higher education a bubble. The charts shown below, present the other side of the coin. 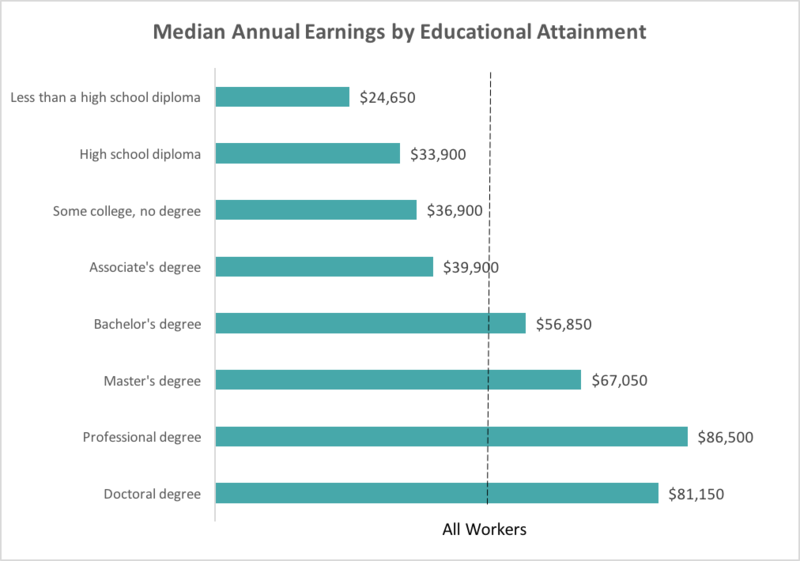 As illustrated in the first chart, the annual earnings of Americans with a Bachelor’s degree is 1.6 times higher than that of an individual without a college degree. 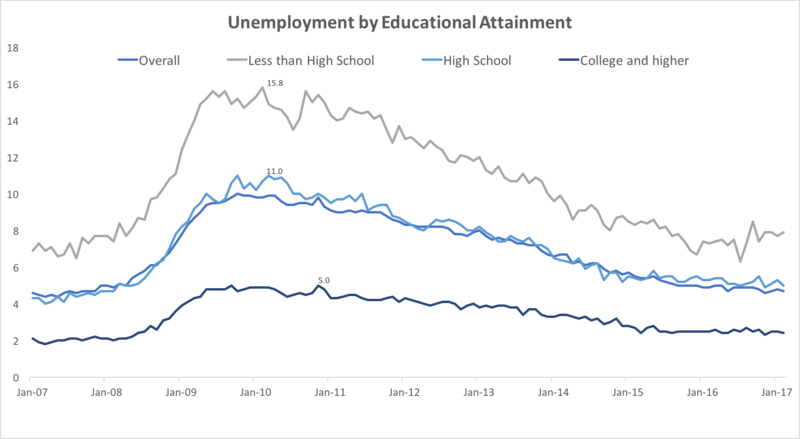 In addition, the second chart shows that a college graduate is twice as employable than someone who never went to college. From this data, we can see that, on average, a college degree increases both your chances of employment and your earnings once employed. Even though the education system may be trawling behind the technology curve, I think it would be unfair to say there is NO value in a formal higher education. Is ALL College Education Worth It? A nice way of figuring this out, is to look at schools’ Net Return on Investment (ROI)* i.e. how do the financial benefits gained from attending the school, compare to the financial costs. A positive ROI means that the benefits outweigh the costs, while a negative ROI means that the costs outweigh the benefits. Some colleges have proven to be worth their fees, and some have not. 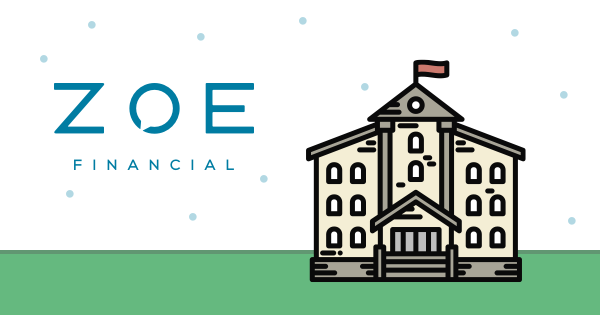 Payscale, which focuses on bringing light to employee compensation, took a comprehensive approach to quantify the ROI for students attending U.S. private and public colleges. It did this by surveying hundreds of thousands of full-time employees who have only a Bachelor’s degree. Like any research, it is not all encompassing and it has its faults**, but I think it serves its purpose for this discussion. Click here for full methodology or scroll down if you want to see main assumptions. 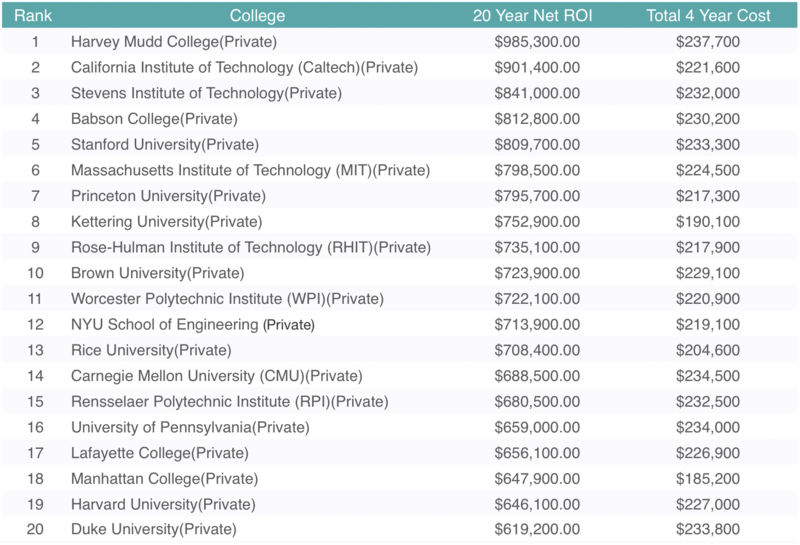 The list below shows Payscale’s top 20 private colleges by Net Return on Investment (Net ROI). Many people may question whether Ivy League colleges really provide enough value to justify the costs. However, according to Payscale’s ranking MIT, Princeton, Brown, Upenn, and Harvard all make the Top 20 for “Best Value” private colleges. Another factor to consider here is the type of graduate that a college produces. A fun example is shown in the chart below. 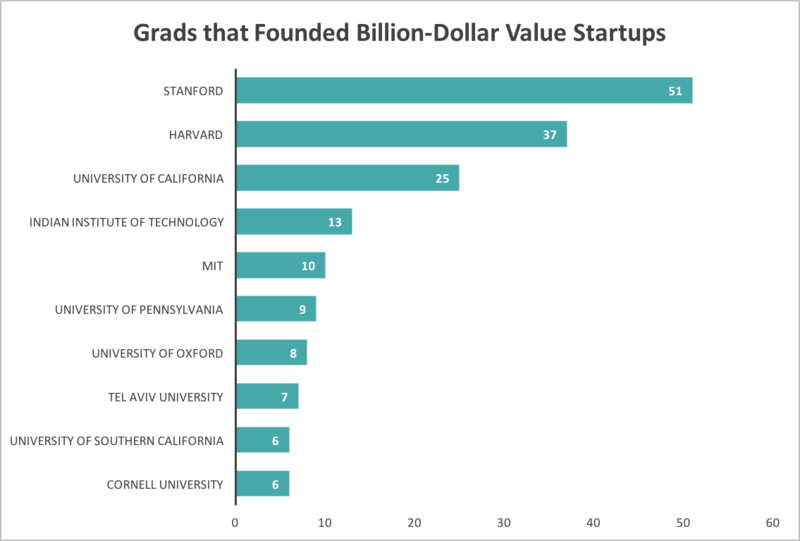 It lists the Top 10 global colleges that produced the most founders of billion-dollar valued startups over the last 12 years. According to research done by Sage, a UK based accounting firm, it turns out that a staggering 172 out of 498 entrepreneurs who founded or co-founded the world’s 250 “unicorns” earned degrees from these 10 universities. So, if you want to create the next Snapchat, attending Stanford will not necessarily guarantee anything, but it won’t hurt your chances. Note: The above research is not quite inclusive. After all, not everyone can get into Stanford, and 172 students is not a wide enough sample of representatives for these schools’ student body. The top of the “Best Value” list shows us which colleges give you bang for your buck, but which schools are at the bottom of the list? 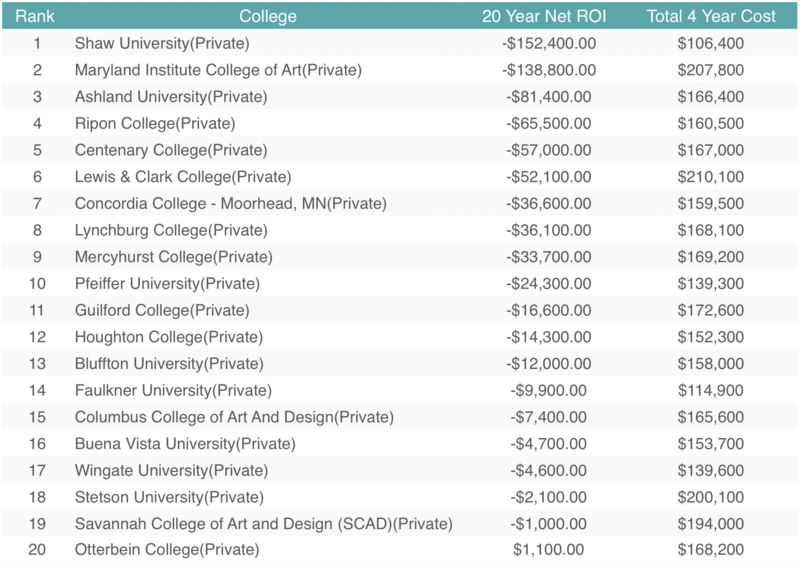 As you can see below, schools like Maryland Institute College of Art actually generate a negative ROI. This means that the median earnings of graduates over 20 years after leaving Maryland, were lower than the cost to go there. So, going back to the original assertion, that all college education is a good investment, it is fair to say that evidence proves otherwise. 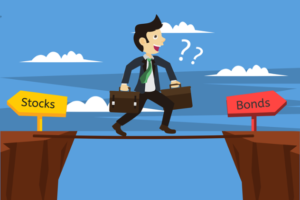 Although it is clear that a college education can increase your chances of finding a job, and your salary once employed, it depends a lot more on the college itself than one might think. 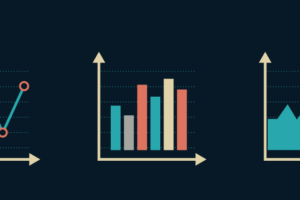 In some cases, you may be better off not attending school and investing the money in the S&P 500 – the ROI over the next 20 years may be greater than the alternative. If you enjoyed this post, check out How Much Is Your College Basketball Team Worth?